SparkFun's five laws of drinking at work, where the beer flows like wine. This is a post about corporate culture. Well ya, that and beer. 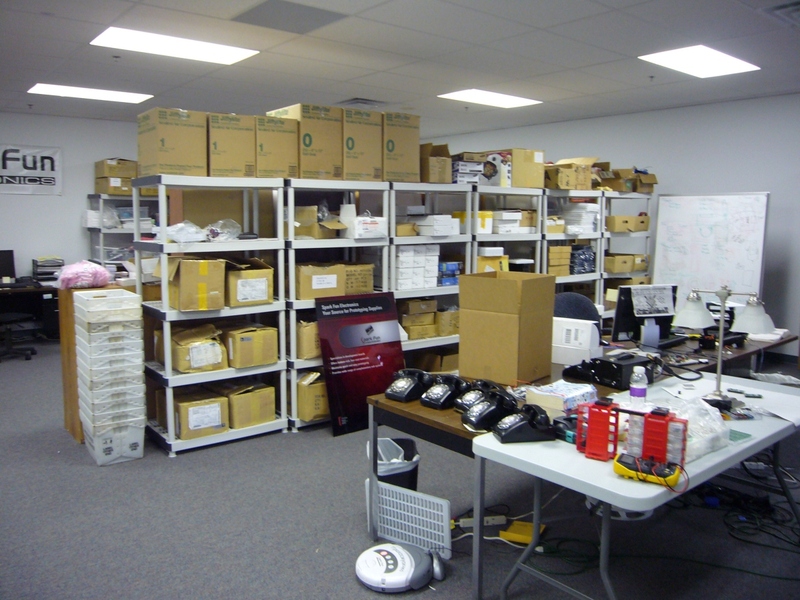 SparkFun shipping floor circa 2005. Check out the Roomba - that was our "janitorial service" for about six months! 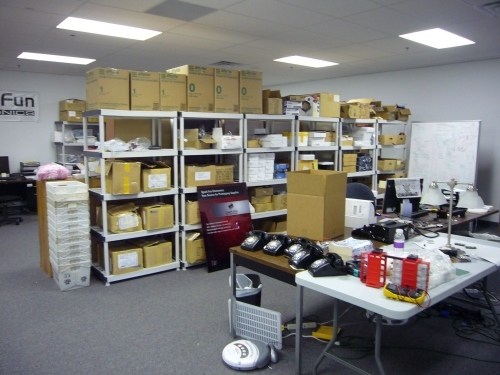 Back in 2005, SparkFun moved into a commercial space from a basement. There were only about 11 of us working in an amazingly roomy 2,300 sq ft space. We often found ourselves sitting around the office talking about the future with a six-pack of beer. What made it special was that we were doing something that everyone told us we couldn't do. Kind of like when you move away from home and you buy the super sugary cereal for the first time -- the type your parents never let you buy. We were all grown up, and we could drink beer at work if we wanted to. And surprisingly, it helped! The flow of new ideas and great conversations was fantastic. So we decided in 2006 to get a kegerator. Our building-mates (medical device and drug manufacturers) thought us quite odd indeed. We decided it was important to put a few rules around the keg, so over a beer we collectively made some rules to make the office a place we all wanted to work. Fast forward six years, and I cannot begin to tell you how many people have told me that beer in the office is a horrible idea -- cataclysmically bad in fact. What they failed to see was that a keg is not about tempting risk and liability, it is about a different work environment where folks are asked to take on a certain amount of trust and responsibility. They obviously had never heard of such things. This is the work of the new graphic designer at SparkFun, Pete Holm. He took what we were trying to say and made it 11 times more understandable. Have a look, it's pretty good. Will we always have beer at SparkFun? Perhaps not. I am not going to claim the keg has never been abused, but I do believe the keg is respected. The keg will stick around until we can no longer respect the privilege. In the mean time, we've learned a powerful lesson about the difference between business necessity (paying taxes) and business tradition (wearing slacks). As long as we make something a priority (cool people, skateboards, beer, lolz) we can make it happen. "See boss, SparkFun does it." Just because all of Sparkfun bungee jumps off a bridge in Estes Park doesnât meanâ¦ Sorry, I was just thinking what my boss would say... Makes you wounder if Sparkfun is going to be the next REI? He's thinking about it. :) He's been "joking" about getting a beer fridge for a while and frequently makes references to alcohol. If it wasn't for the fact that we are based in a Gov't building and still in start-up phase, we'd probably be doing it by now. We have gone for "off-site meetings". It helps that we can point to another professional company as yourselves and say "It's been working for them for years now." He just said that he's worried about liability. I also think there's a concern about how it would be perceived. 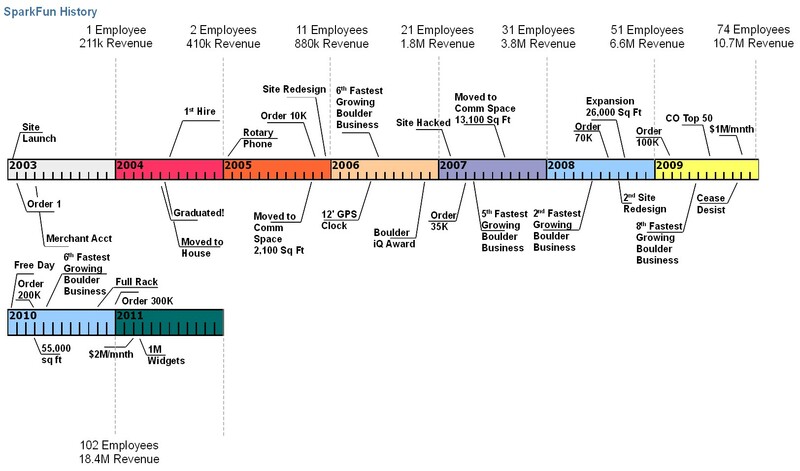 The difference between business necessity and business tradition is an important one - too many companies start out as good places to work and adopt restrictive / punitive policies less because they lead to success and more because "that's what successful company x is doing". Glad to see you guys are keeping that in mind! You guys are living the dream. If and when I'm running my own business, it will be strongly modeled after your business principals and ideals. Hey Sparkfun, you're a great company. If you ever want a physical prototyping department for custom plastic parts like, well pretty much anything, I'll give you a deal. Just give me my own floor and a salary, I'll hook you up to become the go-to made-in-america manufacturing place for medium volume products and custom prototypes. I work weekends. I play drums. Please love me? If you guys decide to sell posters of this... Put me down for a couple. The unsung hero of this story has to be SF's liability insurance carrier. It's largely because of the presence of SparkFun in the area that I was inspired to form Geekify Inc in Boulder. Your company is a huge inspiration and motivator and proof that cool things can be done by passionate and like-minded people working to make the world a more awesome place. I love reading posts like this to see the kind of atmosphere that I want to imitate in my own company, and seeing that kind of setting be so successful for others is a huge boost to the idea that it can be done successfully :). Keep it up! So does 4 imply that you may drink at other times that are not the end of your shift provided you check out, and follow other rules? Also, pure gold: "* Visual hyperbole. Refrain from assaulting Sparkfun guests." I assume that means that it effectively extends your shift by the amount spent over 15 minutes, but you still can't start prior to 1 hour before the normal shift end. Actually, its a pretty cool idea for a geek company. Think about it, the jocks and other non-geeks tended to throw the most egregious keggers out there, so if a intern that finally got his or her own beer stein starts reliving old football victories and various nerd-hazing escapades, then perhaps its not to be. Not everyone can setup a sword in a stone... Though with the right electromagnets and a few LiPro batts... Um, nevermind. I love how this is sparkfun.com/news/911. can you guys get 'Ranger' in a keg? -and a big 'ole jar of those pickled eggs? I just hope my employees dont get wind of this. Hey guys, I started the AeroQuad open source project and it has grown so wonderfully that I've been able to open up a shop, just last week. Looking at Nate's pictures just reminds me of what I'm going through now. Please check out pictures at: http://aeroquad.com/showthread.php?5908-Special-Announcement-please-read! So what do you guys do for the Non-Beer drinkers? I am sure there are a few around. I seem to sense a new product. A beer stein laser etched with the Sparkfun logo. 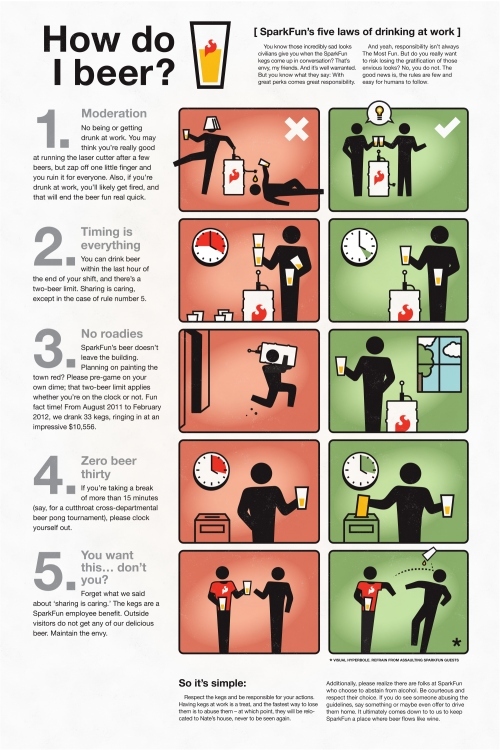 The 1-hour rule sounds like the beer has been abused a few times. Not exactly. We have two kegs and nearly 150 people; the rules are only in place to limit consumption so that everyone who wants to has a chance to enjoy it. Maybe instead of all these rules you had a simple timing priciple. To down the beer is to insult the brewer. Limit 1 per two hours. Then again, it seems rationing would be another issue to manage. A new project for Pete! One of your finger print scanners http://www.sparkfun.com/products/8839 hooked up to Arduino interfaced to the kegerator. Although we LOVE to over-engineer things, in this case we prefer to trust each other. It's a far better world to live in where you do the right thing because you want to, rather than because you're being watched, access-controlled, or otherwise mistrusted. Ditto at a place where I once worked. From this culture I can really see that your team is getting to do some excellent work. Important things like HDD pen guns, HAB launches and brilliant videos about Inductors (well I found it interesting). Plus an awesome site for buying and building these things myself. Keep up the great work and have a beer for me! By the way, do you guys have any "Cell Phone Rules"? Our summer college and youngest people are constantly taking calls or walking out the door to talk in the parking lot or texting. Old school was no personal calls during business hours and was often hard to even use a phone during a break or lunch. Stuff like that varies from one department to another; managers are given a lot of latitude in how they manage their people. Now dog rules...that's a whole 'nother post. Ha! Been through the same thing. It looks very familiar, especially those bins the Post Office so kindly supplies that tend to be used for half the inventory. By the way, I have a couple of rotary phones from when you sold a kit. By the time I got around to convert them you had dropped the kit version!). We have a couple kegs at Urban Airship and I think the only rule we have is #3, and take a cab home in the likely event that you fail at #1, but no one here operates machinery. No standard beer drinking glass? I expect using the 100 oz. Travel Mug you can get at Signal would be frowned upon, of course. "What? This is only my first one!" Kegs of beer cost 320 bucks each? I had no idea they were that expensive. According to the Inter-Tubes, a full keg is 15.5 gallons (165 12 oz. servings.) So that's 1.94 a beer, or 11.63 a 6 pack. What kind of beer are you getting??? A pint is the understood standard...preferably, one of ours. No one, anywhere, should ever drink beer from a plastic travel mug. Good point, once you are over 21 you can drink out of a clear glass vessel. You have a very refreshing company culture! Also, kudos to your new graphic designer! That's an impressive graphic! What kind(s) of beer do you all have in your kegs? We keep one keg of microbrew (we're surrounded by good microbrew in Boulder) and one "macro-brew" a standard like Bud or something for the folks who just want a b-e-e-r.
Our beer czar and tech support manager, Tim, does a great job of selecting beers and keeping them coming! Now you just need to brew and bottle your own micro-brew. Sparkfun Micro-Brew anyone? A red lager named RTFM maybe? We may not have Sparkfun in Frederick, MD - but we did manage to snag Flying Dog from you Coloradans. Hahaha, heck yeah. Avery is another local favorite that may distribute out there, I know they did in Virginia when I was still living there. mmmm Avery. When I was at Summer of Sparkfun I spent most evenings experiencing the afterglow of Mephistopheles' 15%. I'm partial to The Beast myself, but all three demons of ale just rock.